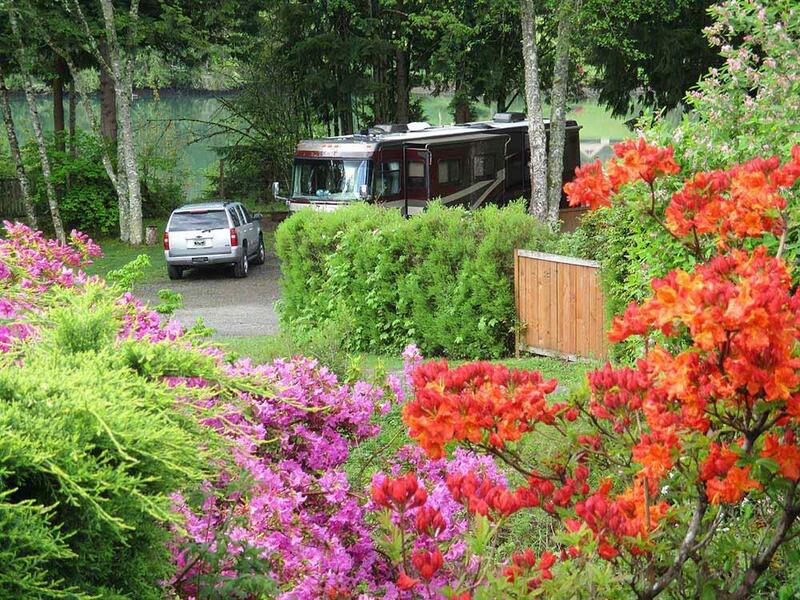 Relax, fish, swim, boat, camp, ski from beautifully landscaped park on 13-mile lake near Mt St Helens & Mt Rainier. Big-rig sites, deluxe park models & boat rentals. Travel Destination for weddings and family reunions. Park models have decks, tables and fire rings. Some have private fenced yards. This is a great park. The owners were so friendly and we had a wonderful site over looking the water. We rented a boat and went and explored the lake and it was so easy to arrange. We stayed during the week so it was not at all crowded. We had a great time and will go back. The park is very well kept and arranged in a way that most sites have some privacy from those adjacent to them. The owner and staff were helpful and polite. Reserved a pull through spot, and the was 50, 30 and 20 amp service on the post. The cable has a little static on a few channels (but who goes to watch TV?). There is no place to swim in the lake from the RV park as there is no real shore nor was there an attraction for the little kids. However, 2 miles west is Ike Kinswa State Park. The swimming area is PERFECT for little ones as they have roped off areas where it is shallow for a good 30-40 yards. Also the park has toys for the kids and shade trees for the monitoring parents. When you come back from the state park, the kids can ride bikes around and have fun with the other children. The RV park is expanding across the street with more sites. Had a good time. Would return! Beautiful lake, flowers. The cabins are far above normal - beautifully decorated and maintained. 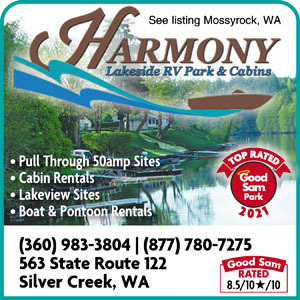 We look forward to returning to enjoy the rental boats on the lake, boat tours and more. We were very pleased with the service and the property. It is a quiet, beautiful park with nice amenities. Excellent park. Very friendly and knowledgable staff, nice setting. We'll definitely stay here again. Every time we stay here it is the best . Imagine having your own boat anytime you want it. Your boat is always clean, fueled & waiting for you at our dock...Party boats, 14' fishing boats, kayaks, pedal boats, canoes & paddle-boards are in our boat inventory! Modern Deluxe Cabins feel like Upscale Studio Apartments! 'There's No Better Way To Camp' Relax in the splendid outdoors at the lake by day and lounge in your upscale secure cabin at night. Our designer deluxe Cabins come complete with full kitchen, full bath with linens & bedding.